With cryptocurrencies continuing to be one of the most popular ways of starting new businesses these days, users will need a secure place to store their crypto-wealth. By introducing Opera for Android with Crypto Wallet…(we will be)lowering the barrier of entry into the web of the future for users and developers alike. Since the wallet is built into the browser, this means internet users no longer need to install separate Dapp browsers or crypto wallet extensions….Developers, on the other hand, are getting an incentive to create decentralized apps (Dapps) for web3, since Opera is about to make them mainstream and available to all its users. Opera has already started the private beta testing program for its crypto-backed mobile web browser for Android on an ‘invite-only’ basis and plans to add the functionality via a stable update to the regular Opera mobile browser soon. 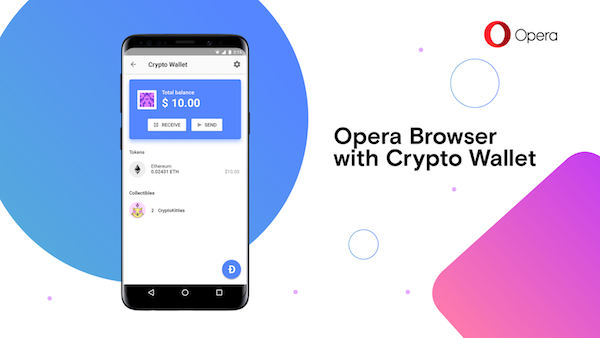 Opera’s crypto wallet will support Ethereum Web3 API, and the best part is, users are no longer required to download a separate extension or a software to carry out cryptocurrency transactions, as they can now do so from the Opera browser on Android. Users can choose to create a new Ethereum-backed crypto wallet or import the details of an existing one to the browser. While typical wallets require users to create new PIN codes or passwords; Opera’s reliance on Android’s secure system lock to sign transactions from the cryptowallet means there is no need to learn any new codes to start using the wallet. The browser has a ‘Dapp Explorer’ section which contains a list of Decentralized Apps (Dapps), which can be accessed from the browser’s speed dial or the crypto wallet’s main view. So the availability of in-built wallet avoids the need to install a separate Dapp browser or extensions. ZANU-PF Claims They Only Sent Messages To Supporters Who Attended Party Meetings; Does That Add Up?